This Wednesday, Tencent WeStart (Hong Kong), the new creative hub that acts as the gateway to China for digital entertainment startups, and WHub, Hong Kong’s largest startup community platform and power-connector, officially signed an MoU in WeStart's Kwun Tong location. The two startup influencers are joining forces as preferred partners in fostering synergies and building bridges for startups in the Greater Bay Area (GBA). 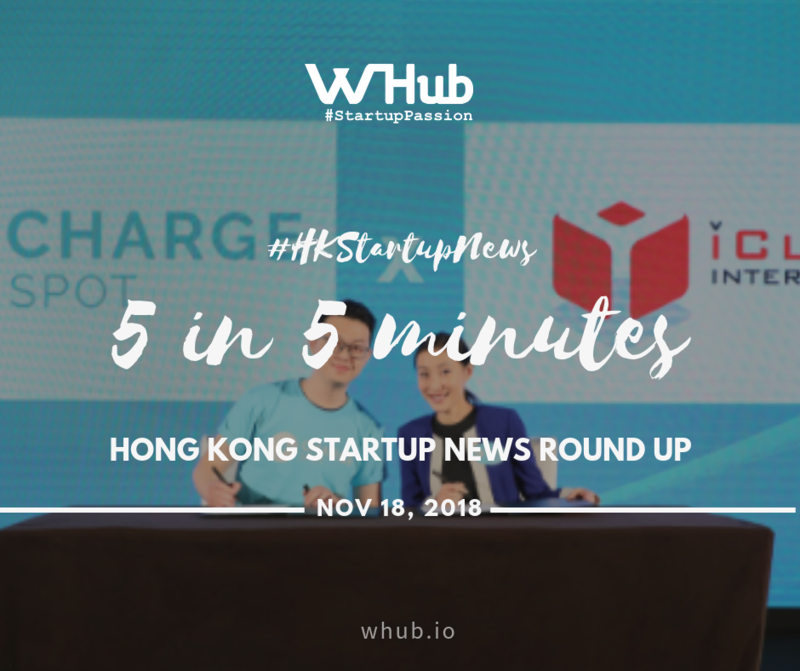 While Tencent WeStart Hong Kong will become a channel for WHub’s startup community to establish themselves and scale in China, likewise, WHub will connect the creative hub to international startup communities and stakeholders, helping startups looking to scale regionally and globally. Tencent WeStart Hong Kong will also be involved in Startup Impact Summit organised by WHub during StartMeUp Festival 2019 to bring creativity into the program and awe visitors with a special experience. If you think Startup Impact Summit is just another conference, think again! ChargeSpot, Hong Kong’s first transnational power bank sharing service provider has achieved quite a few milestones. As of 9th November, they have over 3,000 power bank rental stations along with 100,000 users in Hong Kong. They have just signed a partnership with iClick Interactive Asia Group Ltd, a prominent online marketing company, to provide advertising display solutions with customized and tailored marketing messages for brands on ChargeSpot devices. Already establishing in Hong Kong and Japan, ChargeSpot is expanding into several other Asian markets such as Malaysia and Thailand. “We see a great demand for consumers in Southeast Asia to charge their smartphones. We believe our on-the-go charging service will meet the needs of locals and tourists and bring them hassle-free experience. By the end of 2018, we anticipate the number of our power bank rental stations across Asia will exceed 14,000,” says Davis Chan, co-founder of ChargeSpot. US private equity firm Warburg Pincus announced that it is investing up to $413.5 million into Hong Kong-based Weave Co-living, and has launched the partnership with a $181 million bet on the sharing economy startup. The partnership with Weave is the first time that the firm, which manages more than $47 billion in private equity assets worldwide, has invested in an Asia rental accommodation platform outside of mainland China. Weave, established last year, plans on using the newly acquired funds to grow its portfolio to over 10,000 bedrooms across major Asian cities over the next five years. KuCoin, an HK-based international cryptocurrency exchange, with support for both NEO and GAS markets, announced today it has secured a $20 million Series A investment to bring cryptocurrency to the masses. The latest round was led by IDG Capital, Matrix Partners and Neo Global Capital, industry leaders in technology and venture capital investments. The partnership meets a critical market need and leverages key strengths of each partner — from IDG Capital’s marketing power, Matrix Partners’ resources and support, to Neo’s leadership in the early investing of the most promising blockchain projects and KuCoin as one of the most advanced trading platforms in the crypto industry. The exchange has already attracted more than 5 million registered users. This investment in KuCoin will create more secure, widespread global access to this rapidly expanding technology market. Co-living rental platform Hmlet, which has acquired Hong Kong counterpart “we r urban” in July, has raised a US$6.5 million Series A funding round led by Sequoia India to expand the business in Southeast Asia. “The funding builds on a great year for Hmlet and will enable us to continue to extend and grow our community,” said Hmlet CEO and Co-founder Yoan Kamalski.